Israel faces an unusual set of circumstances more than 60 years after it was founded on top of an existing nation. It has amassed a huge arsenal of weapons of mass destruction and has built up an impressive military apparatus (largely through outside support, first from France and then from the US). It also has won against Arab regimes in successive wars. Yet, Israel faces many political and even existential challenges. A state that was arrogantly declared to be a "light unto the nations," has become a symbol of aggression, war crimes, and ethnic and religious discrimination. A state that sought US support to maintain military superiority vis-à-vis Arab regimes was humiliated on the battlefield in south Lebanon in 2006 by hundreds of armed youngsters. A state that bragged for decades about the skills and superiority of its intelligence apparatus, botched an assassination attempt against Khaled Mishaal, the Hamas leader, and kidnapped a Lebanese farmer in 2006 because his name was Hasan Nasrallah (and it took Israeli 'experts' a few days to decide that this was the 'wrong' Hasan Nasrallah). A state that signed peace treaties with several Arab regimes and which maintains secret relations with many others, remains hated by the Arab and Muslim public. It seems that the stronger Israel gets, the more impotent it becomes in influencing its status in the region. The Goldstone report has only added to Israel's problems. Israel initially relied on the US to cover up for its war crimes and the US has always come forward either in the UN or in the US congress to save Israel from condemnation and disgrace. The US has used its veto power in the UN Security Council largely for the sake of Israel. Israel has assumed, especially since the Cold War, that it can always rely on its American ally to save it from international prosecution on war crimes charges, especially in the wake of the founding of the International Criminal Court (ICC). But Israel is also aware that public opinion towards Israel has changed all over the world. Even the Turkish government (a key strategic ally for decades) had to distance itself, largely in response to public pressures. Public opinion in European countries has shifted in favour of the Palestinians, even in countries - like Germany, France, the Netherlands, Sweden and Denmark - where fanatic support for Israel has been a government policy for decades. The annual votes on Israel at the UN General Assembly are quite indicative. Year after year, Israel finds itself in a small group that comprises the US, the Marshall Islands and Micronesia. The rest of the world is on the other side, although some European allies of the US usually abstain from voting for fear of US retributions. When Israel sought US help, the administration of Barack Obama, the US president, assumed the matter would be simple. Mahmoud Abbas, the Palestinian president, can not turn down any request by the US, no matter how humiliating the offer. Thus, Abbas succumbed to US pressures and asked his ambassador in Geneva to agree to shelve a discussion on the Goldstone report in the UN's Human Rights Council. The US (and the Abbas regime, ironically) miscalculated. They did not realise that there are limits to what even the constituency of Fatah would accept. But, it was too late to reverse course: The Israeli government had to choose between allowing the discussion to go ahead or undermining the credibility - or what is left of it - of the Oslo regime in Ramallah. And Israel faces other dilemmas on this issue. It can insist that the report was biased, but this time it can not accuse its author of anti-Semitism. Neither can it accuse Goldstone of sympathising with Islam or Islamic fundamentalism. The judge, as his daughter informed Israeli media, is a Zionist who cares about Israel, but the evidence of war crimes was overwhelming. The Israeli government can not resort to the propaganda clichés it has practiced over decades of disregard for international regulations and law. 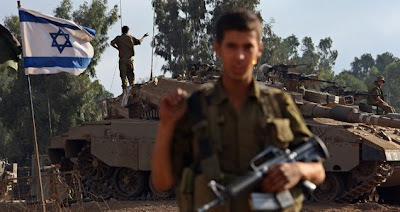 The US could not save Israel this time because many countries saw firsthand the scenes of the brutal assault on Gaza and its civilian population. Israel also knows that there is a new international moral framework emerging: a framework that produced the ICC, as weak as it still is. The ability of Israel to launch wars and invasions without any regard for international law or basic morality will be more limited over time, even if US support for Israel remains constant. The EU has advanced the cause of international intervention in the name of an international morality in cases where war crimes occur, especially if they occur in a pattern over a period of time. It is possible that the savagery of the Israeli attacks on Lebanon in 2006 and Gaza in 2008, may be more difficult to replicate in the future, and that will only deepen the predicament of Israel - a state that has operated on the assumption that brute force alone can solve all of its problems. Israel claims (just like the US) that no international body has the right to investigate, prosecute or judge its war conduct because it is a 'democracy'. That line of defence sounds weak now, not only because the racism of the Israeli state (manifested at so many levels of government and official rhetoric) has become more exposed, but also because Israeli war conduct is indistinguishable from that of the most brutal regimes. Israel also does not have a history of credible internal investigations into the behavior of its armed forces. The OIC, it should be remembered, opposed the arrest warrant issued by the International Criminal Court for Sudanese President Omar al-Bashir. In other words, in the view of the OIC international law is war by other means. It is an instrument to be used for its members' benefit or ignored if inconvenient. "To be sure, some human rights groups have alleged crimes by Israeli forces in Gaza. But, according to Palestinian accounts, 1,409 people were killed during the offensive, of whom a substantial number were armed Hamas fighters. In contrast, the United Nations has reported more than 300,000 civilian deaths in Darfur as a result of the genocidal campaign sponsored by Mr. Bashir. Scores of villages have been systematically burned, and thousands of women systematically raped. Mr. Bashir responded to the ICC's arrest warrant last month by expelling international aid groups from Darfur. The result has been growing food and water shortages and new epidemics, according to the Enough Project." BTW, 6,000 of those Sudanese refuges have come to Israel. Somehow, the Zionists seem less evil to them, then fellow Arabs.